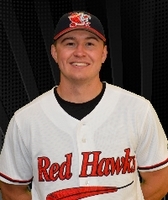 The Fargo-Moorhead RedHawks acquired Irey in a trade with the Cleburne Railroaders on July 17, 2018. Irey, 22, played 154 games for the University of Jamestown baseball team over the past three seasons. He hit .328 with 10 home runs and 73 RBIs in 344 at-bats for the Jimmies. Behind the plate, Irey had a .989 fielding percentage and committed only 12 errors in 139 starts.